Kinda a weird question but does anyone know if the 06 250 jm name is different? Hmm. I see the skin the selection menu thing but it doesn't show up in game. I wonder if some skins just don't work. KTM57 wrote: Any error messages? Yes in the chat it says It cant load every jm on the bike so like the forks number plates etc. It sounds like you've mismatched the name of the skin and the model. Can you screenshot all your files? KTM57 wrote: It sounds like you've mismatched the name of the skin and the model. Can you screenshot all your files? The file is saffed But I can show the names that I have it in the saf. 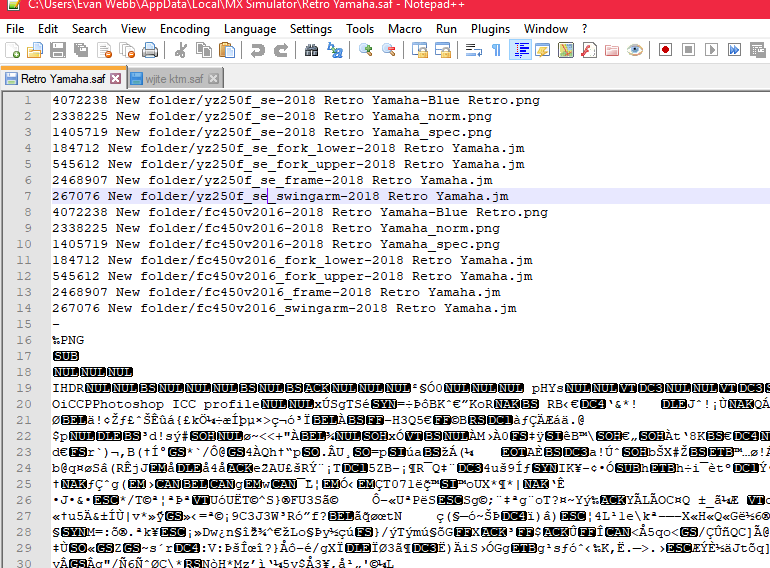 Looks like the model files need to drop the "_se" tag because the game looks for the model under the regular yz250f. I almost missed it in the error messages and was scratching my head for a second. Put this down in the MX Sim trivia book. It has probably been 10 years since I stuck a skin on this bike, and we ran stock models back then. KTM57 wrote: Looks like the model files need to drop the "_se" tag because the game looks for the model under the regular yz250f. I almost missed it in the error messages and was scratching my head for a second.